Finally! The Halloween festivities return this year, but this time with the new Multiplayer game mode available! This version of Multiplayer is Online Co-op for 1-5 players. It works by using a Steam lobby system. servers on the Multiplayer browser. For this build, the only game type available for Multiplayer is Co-op. This means that you will be playing cooperatively together and not attacking each other. In terms of save data, the host takes ownership of the World and the players keep their own Character data. them to show only servers hosted by your Steam friends. Please be aware that Multiplayer development is still on-going and you may experience some bugs. If you encounter any issues, please see the Steam Discussions for bug reporting. This kind of development is rather problematic, so I am expecting a certain amount of code fixing to do. The profile images shown for NPCs during dialogue have been changed to a pixel style aesthetic. We feel this better suits the style of the game, compared to the previous illustrated look. You can click on the image above to see the new profiles at the size they appear in game. Most of sound effects have have been recreated and finalised for a more consistent sound style. Many of the abilities and monster sounds have been changed, some drastically different, or others less so. Overall, the quality is definitely better and I think certain things are given the quality they deserve now. In particular the Sentientpede sounds a lot more intimidating and now matches it’s stature. Many thanks to Chris Dain, who was drafted in to perform the mighty task of revamping. Medea the Witch has returned to Azuria. This follows a return of last year’s festivities. Azuria is aglow with Halloween decor. 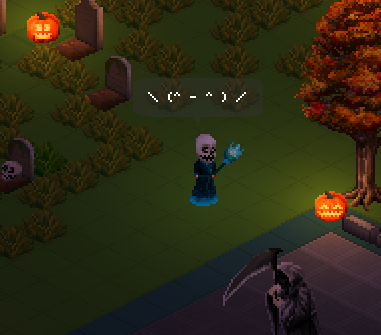 Take part in Trick or Treat (now with friends!). During big builds like this, I’ll often forget to mention little tweaks/changes that get lost in everything else. – Some HUD GUI elements have been redesigned in line with multiplayer changes. – A costume item slot has been introduced. This is to allow for players to equip whole outfits that change the appearance of the character, but do not effect the combat statistics. – The Paint Blaster is now classified as a costume item, but still provides the ability to paint. – New costume item Blue Maid Outfit has been added.